Medical simulation training uses advanced educational technology for training healthcare professionals in an experiential learning environment. This is how healthcare professionals receive initial and ongoing training that they need to learn current procedures and lifesaving techniques using a high-fidelity patient “manikin” (or “mannequin” or ““patient simulator”) and other advanced technology equipment. A medical training manikin is a model of the human body for teaching anatomy, demonstrating surgical operations, and nurse and EMS training. These lifelike models are technologically advanced training tools in which the manikins can breathe, talk, sweat, react to medication and even die. Just as the aviation industry uses flight simulators for pilot training instead of having them jump into a jet and try to take off, medical professionals cannot practice and train on live patients. Medical simulation is sometimes referred to as nursing simulation, healthcare simulation, patient simulation, clinical simulation, nurse simulation training or surgical simulation. This training is often conducted in dedicated units within a healthcare facility or other standalone buildings. However, many organizations operate Mobile Sim Labs, which are fully-equipped vehicles with training personnel and equipment that travel to healthcare facilities and into rural communities. These mobile training labs are staffed by licensed, experienced healthcare professionals and educators who use these healthcare simulation vehicles to provide a realistic learning environment. In these mobile simulation vehicles trainees are in a realistic healthcare setting where high-fidelity patient manikins are wirelessly operated by educational and simulation technical training staff. When a mobile sim lab is used at healthcare facilities: The owner operator may have multiple centers (hospitals and/or clinics) that the mobile unit visits on a route. Thus, nurse and physician training can be performed on the satellite center’s grounds without employees having to travel to and from a central simulation center. 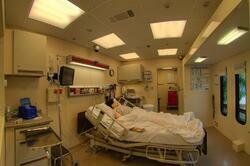 This is a major cost and logistical benefit allowing highly paid and vital staff to remain at their home facility. Otherwise the center must incur costs for training at an independent training center and employee travel. Not to mention the absence of staff that may be needed at a moment’s notice in their facility for emergency situations. When mobile sim is used for rural EMS: Most Emergency Medical Technicians and first responders are certified in the field of Emergency Medical Services at a training center or community college. However, many state departments of health, universities and organizations have taken steps to administer EMS programs in rural areas where there is not reasonable access to dedicated facilities. These custom-made mobile simulation labs bring training to EMT, certified first responders, paramedics or other medical providers with mobile simulation labs. Most rural EMS workers only come across a critically ill or injured patient a few times per year. The availability of mobile sim labs gives them the opportunity to train with these types of injuries and keep their skills fresh. Space is freed up inside the health center because training is outside. Expensive sim lab equipment can be shared across many sites, not just one. Travel for employees is a short walk outdoors, not a drive across the county and back. The mobile unit can develop income for the sim center because it can travel to colleges, and universities for nurse training on specialties, or to rural communities for EMT training. Units can be designed for adult, child and/or infant training. Some larger vehicles may have the capacity for all three, while smaller vehicles may be designed for individual patient types. Coastal Carolinas Healthcare Alliance of Wilmington, North Carolina builds stronger peer relationships among hospitals on the coast of North Carolina. Owned entirely by their member hospitals, the organization has grown into one of the top hospital alliances in the country, serving a population of approximately one million people living in North and South Carolina. Coastal Carolinas Health Alliance’s aim is to improve the health and wellness of those residing within their region through collaborative efforts. Through grant funds, Coastal Carolinas Health Alliance was able to start a Mobile Simulation Program. Those funds supported the purchase of several patient mannequins as well as building the Mobile Simulation Lab truck. The Mobile Simulation Lab’s technology allows training participants to practice emergency scenarios on life-like patient simulators without real life consequences. Patient assessment, clinical reasoning skills and group dynamics are all observed, evaluated and reinforced according to current policies and procedures. Coastal Carolinas Health Alliance has six health care centers that their mobile unit visits on a route. This mobile sim unit provides nurse and physician training on the satellite center’s grounds without employees having to travel to and from a central simulation center. University of Connecticut School of Nursing and the Connecticut Department of Correction in Storrs, Connecticut introduced the nation’s first mobile nursing training center for correctional facility nurses in 2012. This mobile unit is a partnership with the Department of Correction (DOC) and the Correctional Managed Health Care (CMHC) Division of the UConn Health Center. The mobile training center and the UConn-led training sessions for the prison nurses are fully funded with a $1.1 million grant from the U.S. Health Resources and Services Administration. The vehicle includes a multitude of simulation features to let UConn faculty provide on-site training for prison nurses at their correctional facilities, resolving limits on time, space, and staffing that can complicate those professional development efforts. MedStar Health Simulation Training & Education Lab (SiTEL) of Baltimore, Maryland and Washington, DC (an authorized training center for the American Heart Association) is a large regional care provider that supports learning for associates throughout MedStar Health, a 10-hospital, $5 billion not-for-profit healthcare company serving the Baltimore and Washington, D.C. region. Their SiTEL mobile training unit “provides courses, consultation, tools and events for solving problems and seeing, understanding and thinking differently in their challenging environment.” They focus on providing engaging, meaningful learning experiences that enable associates to discover new ways to deliver the best care for patients. Northeast Georgia Health of Gainesville, Georgia is currently undergoing a Mobile Simulation Unit Funding Initiative. They are seeking $700,000 to purchase a mobile simulation unit (SIM) for training of Northeast Georgia Health System (NGHS) staff and provide operational costs for the first five years. Their primary objective is to enhance patient and employee safety through simulation training in a mobile unit that takes training to all NGHS facilities and off-site locations. 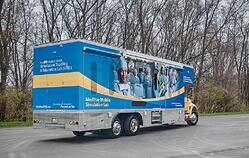 This sim training vehicle will provide enhanced quality patient care. The NGHS staff will be able to move from novice to competency with no risk to actual patients as new techniques are learned and skills continue to be developed and practiced. With continual advancements in technology, medical professionals require ongoing training to keep up with changes in medical technology, new procedures and to stay fresh in their skills. Implementing a state-of-the art mobile sim lab program for nurse education, EMT training and other requirements for simulation in healthcare helps hospitals, universities, state departments of health and healthcare alliances provide highly cost effective training services to their staff. Mobile units are ideally suited for “equipment sharing” in simulation training across healthcare groups and communities. It’s very expensive when staff from multiple healthcare facilities, fire departments and clinics need to travel to a simulation lab center. Instead, having a mobile lab that can serve these various facilities, or travel to rural communities is much more cost effective, saves valuable time for staff and keeps them at their home facility. To learn more about the advantages of mobile medical units, download our white paper which details Why a Mobile Medical Clinic Can Help Protect Your Market. Superior craftsmanship makes a bold statement for your patients, your colleagues and your community. 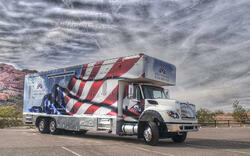 Learn more about owning a world-class, purpose-built mobile unit.